« The Future of Starring You! When we posted about Rock Band earlier this week, people started leaving captions on this picture as if it were a caption contest. So now that they’ve started, why not take it all the way? 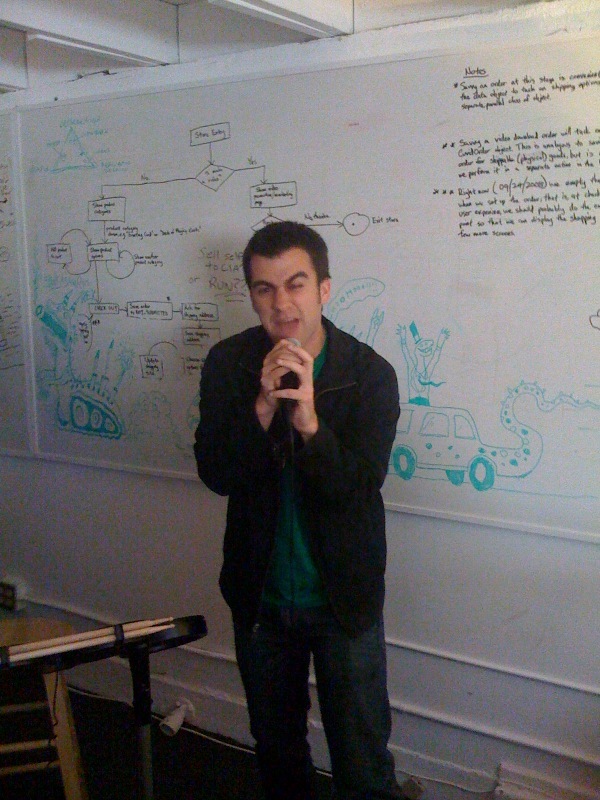 This is Dan, JibJab’s community man and blogger extraordinaire, singing his heart out to either Linkin Park or Bon Jovi. The best caption here or on our Facebook page gets a free JibJab t-shirt in one week’s time! Don’t forget to check out last week’s winner too! This entry was written by paulhanges and posted on April 16, 2009 at 6:34 pm and filed under Uncategorized. Bookmark the permalink. Follow any comments here with the RSS feed for this post. Post a comment or leave a trackback: Trackback URL. it’s hard to play a fake instrument when a pointer fringer. SO I SING!!! PLUS, my gay uncle says i can hit the high notes like Mariah.I love her. …So in conlusion! This is how reptiles are going to take over the world! Any questions? Despite 87 flow-chart revisions, the JibJab team failed to morph Dan into the next Bon Jovi. Dan crescendos in complete denial (pictured above).